Prior to 1808, Catholic families living in the Ballincollig area had to travel to Clash Cross in Carriganarra, Ballinora or Kilnaglory to attend Mass. With the advent of the Powder mills, and the employment they created, the population increased to such an extent that it became obvious a church was required in Ballincollig. 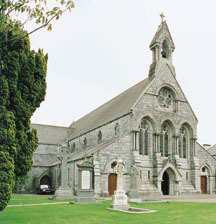 A chapel was erected in 1808 and this served as the parish church, thus replacing the one in Ballinora. It served the community until 1866, when the church of St. Mary and St. John was completed. The chapel was then used as a school and is still in use, having been integrated into the Community Hall complex. In 1865, it was decided to build a larger church, which would not only be more commodious, architecturally more attractive, and, above all, one which would serve the parish for very many years to come. We should be ever grateful to Canon David Horgan for his foresight. He appointed a Mr. George Goldie, a renowned architect, who had designed many churches, both in England and Ireland. His design was in the neo-Gothic style, which was typical of the period. He also incorporated features from other periods and that is why our church is so unique. A site for the church was donated by a Thomas Wise, who also provided the free use of a quarry in Coolroe, from which all the Ashlar limestone was taken for making the blocks etc. required for the building. The builder was a Mr. Barry McMullen of Cork and the church is a testimony to the craftsmanship of the tradesmen of that time. The stained glass windows came from Newcastle in England and the names of Canon Horgan, the Architect, the Builder and others are inscribed thereon. The main altar was provided by the men of the Powder mills, the Lady altar by the women of the parish and the Sacred Heart altar by the Murphy family. We should be ever grateful to the parishioners of that era, most of whom must have had very sad memories of the great famine, for providing the finances necessary to erect an architectural gem so dear to us in Ballincollig – the Church of St. Mary and St. John.